A recent New York Times article, The Most Important Least-Noticed Economic Event of the Decade, describes how in 2015 and 2016 a confluence of interconnected forces had a significant impact on the world economy and the presidential election but not many were aware that it ever happened. This slowdown went mostly unnoticed as it primarily affected the energy and agricultural sectors and their equipment suppliers, but it has some important political and economic implications. This slowdown caused less demand for oil and other commodities such as metals and agricultural products. Emerging economies felt this pinch and falling prices and high debt loads among energy producers in the U.S. generated losses for investors and stoked fears about the overall stability of the global financial system. The Fed intervened in 2016 by deciding not to raise interest rates and reducing their expectations of how much they would raise rates over the remainder of the year. As a result, the dollar weakened, oil prices began a recovery and spending was growing again by summer 2016. The use of technology in office building operations has come a long way from motion-controlled light sensors and key card entry systems. Building owners and operators are beginning to use an array of increasingly sophisticated software and hardware to gather more information about how their buildings can not only can work more efficiently, but give them insights into how to attract and retain tenants. The NAIOP Research Foundation’s new report, The Office Property and Big Data Puzzle: Putting The Pieces Together, by Kimberly Winson-Geideman, Ph.D., discusses what defines big data, how it is being used by building owners, and some of the issues those who are working with big data should consider. Big data is defined as high-volume, high-variety and high-velocity information that is produced in either structured formats (e.g., sensor data) or unstructured formats (e.g., pictures, text). The sheer influx of big data can be overwhelming for many companies; they often choose to sit on the data they collect with no concrete plans to use it. Therefore, some firms, particularly those without the resources to sift through large amounts of data, risk missing valuable information that could improve their bottom line and position them favorably in an increasingly competitive market. Recruiting and retaining top talent has become essential in today's highly competitive marketplace. Is your 2019 salary and bonus package competitive? Find out with the 2018 NAIOP/CEL Commercial Real Estate Compensation and Benefits Reports. These valuable reports enable commercial real estate businesses to stay current on salaries, bonuses and benefits for CRE professionals from executive to entry level positions. The reports include submissions from 400 companies; salary, bonus, incentives and benefits for 200 positions; and data from 100,000 distinct jobs in the office/industrial, retail and residential property sectors. Earlier this week, the Board of Directors for the Charlotte Regional Partnership and the Executive Committee of the Charlotte Chamber voted unanimously to authorize their CEOs and staff to engage in the steps necessary to formally combine the organizations. The Boards of both organizations are expected later this year to act on a formal recommendation from their respective Executive Committees to finalize the combination. It is anticipated that should the Boards vote to ratify the recommendation, the new enterprise will begin operations on January 1, 2019. We are providing the media this afternoon with a limited joint statement, but we believe it is important for you to hear this news from us first. The decision to combine the two organizations is rooted in a belief that the vision and mission of the two organizations naturally align with one another and combining the two will sustain and enhance the economic growth, prosperity and global competitiveness of the Charlotte region. As part of an integration effort, the mission statements of each organization will be reviewed with an intent to build on their respective foundations to determine the mission and vision of the new organization. The intent of the combined enterprise will be to build on the experience and passion of both organizations to galvanize the 16-county Charlotte region through a shared vision and coordinated efforts. The business leaders in our community are committed to building the best enterprise in the country in order to drive long-term growth and a vibrant economy. A unified enterprise provides a clear path and single development team for site selectors and business leaders and owners who are considering a corporate re-location or business expansion. 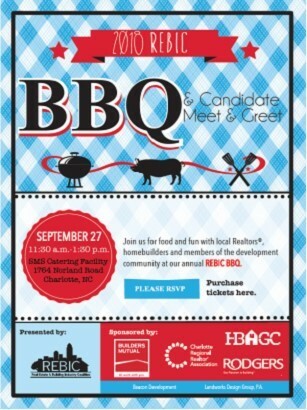 REBIC’s annual BBQ & Candidate Meet & Greet is fast approaching on September 27, 2018! Make sure to get your tickets early! 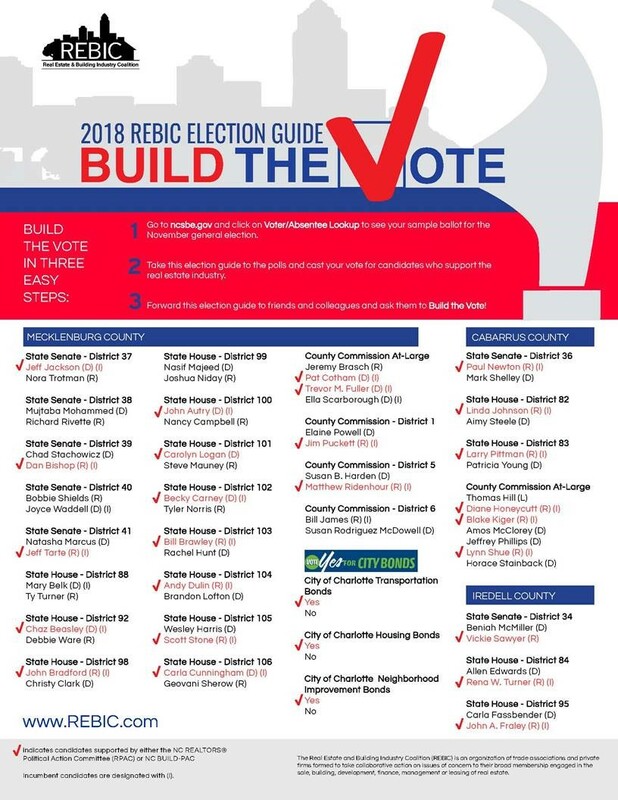 This annual bi-partisan Political Pig Pickin’ brings state and local candidates together with hundreds of members of the Charlotte real estate, homebuilders and development industries for an afternoon of food and fun! Did you know NAIOP has a glossary of commercial real estate terms available online for your reference anytime? Bookmark the page for whenever you come across a phrase you don't know or need a refresher. The forecast for demand for industrial space has risen because of increased expectations of broad macroeconomic growth and job generation for the remainder of 2018 and 2019. According to Dr. Hany Guirguis of Manhattan College and Dr. Joshua Harris of New York University, quarterly net absorption is expected to increase to an average of 60 million square feet for the latter half of 2018 and then moderate to 56 million square feet per quarter in 2019. Advance indications for gross domestic product (GDP) growth for the rest of 2018 show consensus forecasts approaching annualized growth of 4.0 percent for the second quarter, which could result in sustained growth of 3.0 percent or more for the rest of the year and into 2019. Higher oil prices are a leading cause of increased business investment because as oil prices rise, there is more incentive to increase energy production and commence energy exploration – activities that significantly stimulate the overall economy. Another major force at play is consumer spending, as e-commerce continues to generate demand for industrial space. 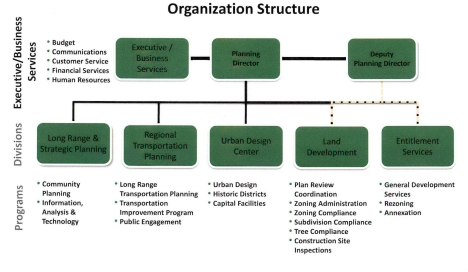 The Charlotte Planning Department is undergoing a comprehensive reorganization, in an effort to streamline the development approval process and reduce the number of conflicts that arise between final rezoning and site plan review. The initiative is moving forward even as Charlotte’s Unified Development Ordinance takes a step back, to allow staff to begin work on a Comprehensive Plan to guide the City’s growth over the next two decades. NAIOP Charlotte has partnered with CREW on their upcoming ABC Networking Event on September 20. Proceeds from the event help fund the scholarships with Queens University and UNC Charlotte. Just hours before coverage was set to lapse for thousands of homeowners, the Senate approved a bill Tuesday to keep the National Flood Insurance Program operating for four more months. President Donald Trump is expected to sign the bill—which cleared the House last week—into law before midnight Tuesday, when the program expires. The NFIP provides critical flood insurance to homeowners in more than 22,000 communities nationwide, but Congress has wrestled for years with proposals to reform the program, which remains on shaky financial footing. Click here to view original post by REBIC. TWO SUMMER COURSES ENROLLING NOW! The number of available U.S. jobs now exceeds the number of people out of work and seeking employment. At the end of April, job openings stood at 6.7 million while the number of unemployed reached 6.3 million. The June 2018 Marcus and Millichap Research Brief finds that an effect of a competitive labor market is that office-using employment is driving down office vacancy rates, and over the past 12 months, the professional and business sector has been expanding at a faster pace than overall employment, driving up office demand. The professional and business sector added almost 500,000 jobs and grew at 2.5 percent compared to the national rate of 1.6 percent. The increased hiring, according to the report, drove down the national office vacancy to 13.8 percent in the first quarter of 2018. A recent report by MetLife states that the expansion of ridesharing, autonomous vehicles and electric vehicles will result in “highly accessible, highly efficient and comparatively inexpensive transportation” over the next decade. Researchers believe that alternative transportation, including ridesharing, will partially substitute public transportation in some areas of the U.S. and complement it in other areas, while also bringing transit access to areas not served by public transportation. The report concludes that the greater acceptance of ridesharing will lead to an increase in value for development sites with good access to uncongested roadways but limited access to public transportation. An infographic by Faith Hope Consolo, chair of the retail sales and leasing division at Prudential Douglas Elliman, finds that “food is the new fashion.” Younger shoppers are more interested in “eating while shopping than their parents and grandparents,” and this behavior is leading to a trend in “eatertainment”-style properties. The report predicts by 2020, the number of food halls of 10,000 to 50,000 square feet in North America could reach 300 (up from 100 in 2017). Additionally, the report recommends a new rule of thumb for malls: 70 percent of their space toward food, entertainment and lifestyle experiences, while the remaining 30 percent should be dedicated to retail. The U.S. Supreme Court ruled in South Dakota v. Wayfair, Inc. that states may collect sales taxes from online retailers, even if those sellers do not have a physical location in the state. That reverses a decision the Court had made in 1992 in Quill Corp. v. North Dakota. NAIOP supports the collection of existing sales and use taxes from online retailers when these taxes are already owed to state and local governments, including backing legislative efforts in Congress that would specifically empower states to do so. Not collecting these taxes puts brick-and-mortar retailers at a disadvantage to out-of-state vendors whose purchasers can avoid taxes, as the Court pointed out in its decision.